I love all sorts of sunflowers. They are my daughter’s favorite flower and I plant them in all of my garden beds each year. I have some in my test garden that are about 7 feet tall right now and still not opened. I plant the large yellow type and rust colored ones too, but I have never had a chance to plant these beautiful teddy bear sunflowers. Image adapted from a Creative Commons Attribution-Share Alike 4.0 International license photo. Photographer Mike Peel. The beautiful thing about these plants is the huge and round blossoms that it puts out. The variety is called a Teddy Bear sunflower and it is just gorgeous. The image below is by photographer Pamela Nocentini who has captured one in all its glory. The plant is an annual, sown from seed each year in the spring. Helianthus annuus is the botanical name. Like all sunflowers, it will need staking to support the heads. Kids really love this Teddy Bear sunflower. This unusual member of the sunflower family is unlike regular types. It has cuddly-looking, 4-5 inch fully-doubled yellow flowers that are held up on sturdy dwarf plants 2 1/2-3 feet tall. Sow seeds in April to May. Do not over fertilize or the stems may break. One source that I have found for the seeds is Territorial Seed Company. I have also seen seeds for sale for this plant on Amazon. 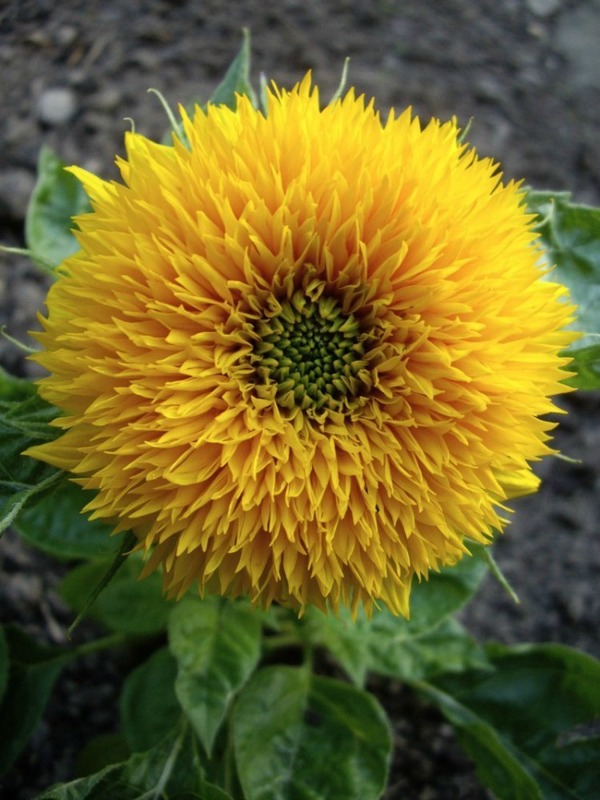 There is also a dwarf version of the teddy bear sunflower. It does not have quite the same puffy blossom but is still very pretty. This variety grows to about 3 feet tall so is quite manageable. I have not tried to grow this plant from seeds from either company. If you do, please let us know how they germinate in the comments below. ones i use to plant never got tall, maybe 12-20in. I have two sunflowers in my yard right now just ready to open that are at least 7 feet tall. They are the biggest ones I have grown yet. Not the teddy bear ones though. I would love to get some seeds for them. I planted the dwarf teddy bear type..they r really cool..really easy to grow, just like other sunflowers..
Hi Cathy. I planted some this summer and loved the way they look! I would be very interested in finding out where to get these seeds from,they are beautiful. One source that I have found for the seeds is Territorial Seed Company. – http://www.territorialseed.com/product/769/406 but I do not know if they will grow into the round ball style shown above. I am hit and miss on my sunflower seeds. They seem to like to be sown in very warm weather. I have just four seedlings from a packet and am really looking to seem them grow. I am not often on this website so you will need to keep in touch for progress reports. Important post script: I am not a gardener. Google “Teddybear Sunflower Seeds” to find out sites to buy seeds. My daughter picked these seeds out at Menards and we are going to plant them soon. We are not professional gardners, so wish us luck! 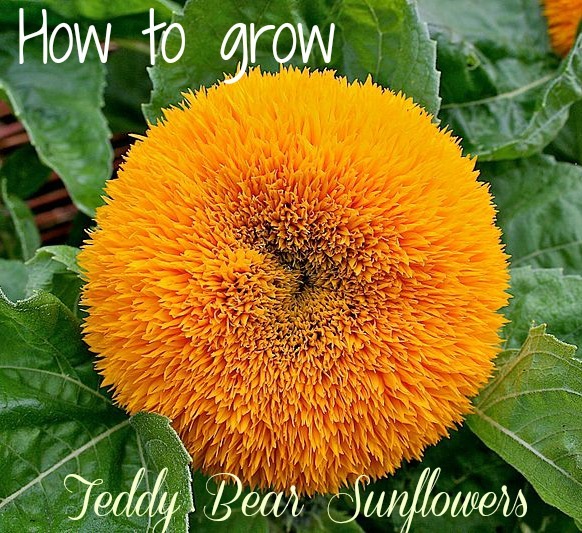 My mom would love teddy bear sunflowers……she has the most unusual but nice backyard I have seen. I am trying the Dwarf Teddy Bear sunflowers this year in Anchorage, Alaska. I got my seeds at Walmart. I planted them in small pots in my South facing window. Very easy so far. I put them out in my garden May 10, 2017. If they do well I will add a photo. I bought some seeds in late May from Walmart. Of all the seeds I planted, only one grew. And just this week it started blooming! So incredibly proud of my little plant (it’s only about a foot and half tall)! And how pretty it is too! I’d love to see pictures when they grow outdoors! This Spring is my first time planting Teddy Bear sunflowers from seed, and the germination was a breeze! Usually I soak my sunflower seeds in wet paper towels, but I just straight sewed these, and they sprouted in about a week. Also Hudson Valley Seed Co. carries Teddy Bear sunflowers for a decent price. All my seeds sprouted instead of the usual 50/50. I have 16 teddy bear plants and all have 3-4 buds. They are doing great but I am curious because a couple look as though they are not going to bloom – but seed instead. DOes anyone know if this is common r if I did something wrong. We had a streak of 2 days over 95 degrees and they were stressed but so many are perfect and some are ‘seeding’ and not blooming. See pictures… ANY ADVICE? Here’s a “very unusual” one from my garden. It appeared recently with a little face in the middle. (Yes, it had a little help from a felt tip pen. I couldn’t pass it up. Lot’s of fun showing it to friends and getting their reactions….from total amazement and belief, to furled forehead and squinted eyes, but always a hearty laugh share by all. I planted a pack of flower seeds in the sprinf and two sunflowers appeared. One is at least 8 ft tall, just opened and it is the teddy bear sunflower. I counted and it has over a dozen blossoms on it! It is the most stunny flower! I am going to attempt to harvest seeds from it for next year. This is my Teddy Bear right now! I have been growing various types of sunflowers for years now as they are my favourite and make a nice cover as well for privacy around decks and what not. I have had some as tall as ten feet and harvest the seeds each and every fall. Some are used for replanting the next year and the rest go to feeding the birds over winter. Just purchased teddy bear seeds last night off amazon and look forward to planting when spring comes around. My daughter loves them so we always have them here. I had good luck with my teddy bear seeds last summer. 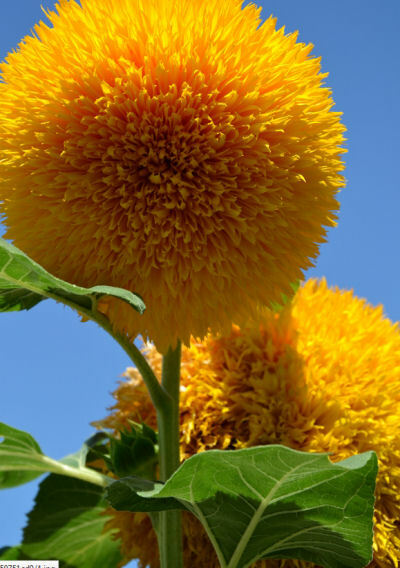 can anyone help me with the fungal or bacterial diseases of teddy bear sun flower i want to do research on it but i am unable to find data regarding this ? You might find some help on this site (The national sunflower association. ).